Bellator has always had a knack for finding good talented prospects from Russia. 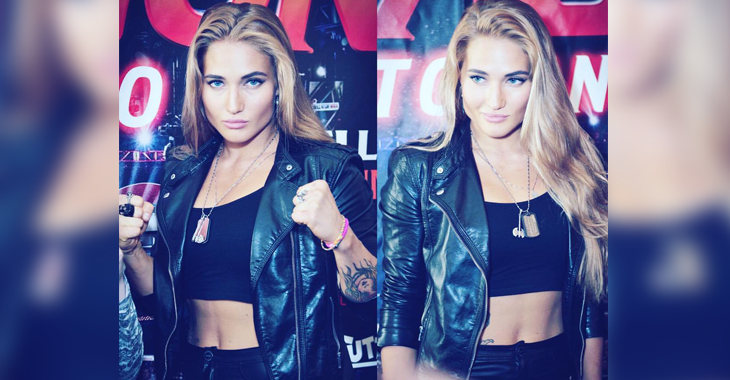 And without a doubt, one of their best rising young stars is the undefeated flyweight, Anastasia Yankova. Yankova has been a part of the Bellator roster since she debuted for them in 2016 with an impressive quick submission over Anjela Pink. The event also marked her first fight outside of her home country of Russia. “I want to stress that I am not affiliated to any Nazi groups. Nor do I share or have I ever shared Nazi ideology. In 2013, I was invited to take a part in my first professional MMA tournament, which I knew would be broadcast on TV, and include a number of well-known sports figures. That was a chance to start my career and back then I saw no reason to turn down such an opportunity. I received my promised pay and was invited to take a part in photo and video shoots to promote a clothing brand. That was a start any young girl taking her first steps in this sport could only dream of. Especially considering the lack of opportunity to do that in Russia back in those days. The brand that Yankova is referring to is called ‘White Rex’ which is a Russian clothing brand aimed at combat sports, similar to Tapology or Affliction. Although the owner has continually denied it, White Rex has been known to targets mainly neo-Nazis. The brand was established in 2008 and she made her MMA debut at an event they held in 2013. Why bring this up now? Well Yankova’s next opponent, Kate Jackson kind of called her out for it upon their fight’s announcement. Yankova returns at Bellator 200 on May 25th and will be competing in her first fight since April of last year when she defeated Edina Kallionidou. Yankova briefly discussed her matchup with the veteran, Kate Jackson and how she didn’t intend to sit out for so long but sometimes things are out of our control. “Unfortunately, I couldn’t compete because of problems with my thyroid gland. And it’s really not a nice thing. I won’t go into the details of what happens to a person with thyroid gland issues. If you want to know, you can always google it. Turned out I’d had a problem with it for some time, and I had no idea. It results in hormonal misbalance, and in my case, I was gaining weight for no reason and didn’t have any energy to train. So for all those critics of my fitness level… I never really wanted to reveal it. I never wanted people to feel sorry for me or something. But I am glad that now this problem is behind me and I am ready to be back. Although it took me a long time to recover. What are your thoughts on Yankova’s entry into MMA? Who will win at Bellator 200?